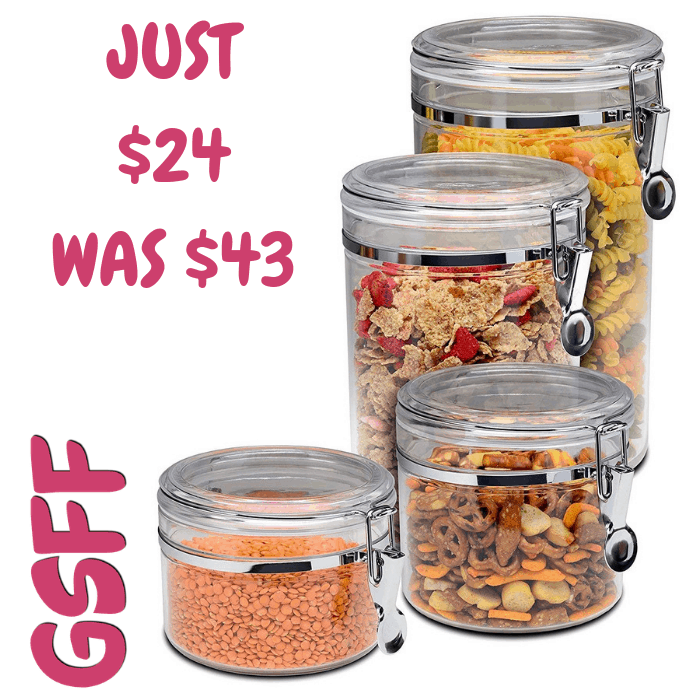 4-Piece Canister Set Just $24! Down From $43! Shipped! You are here: Home / Great Deals / Amazon Deals / 4-Piece Canister Set Just $24! Down From $43! Shipped! Amazon has this Bellemain 4-Piece Canister Set on sale for just $24 down from $42.95 PLUS FREE shipping! This isn’t your typical glass or ceramic—Bellemain containers are completely shatter-proof, and resist breaking even when dropped from the top shelf. Manufactured with easy-to-use and sturdy metal clamps backed up by silicone gaskets for truly airtight storage. Keep your rice bug-free and your dried foods fresh. Pick and choose for ultimate convenience. From coffee beans to catfood, manage your rations smartly with Bellemain.